The safest thing, of course, would be to call the league offices and tell them no one around here is interested in the NHL playoffs. The safest thing would be to sit back and count the statistics. The three 40-goal scorers. The 39-wins by the goaltender. The wins. The comebacks. The consistency. The scoring. At this point, why go on? The Tampa Bay Lightning has just completed one of the finest regular seasons in NHL history. Or, put another way, they have completed one of the grand set-ups any hockey team has ever completed. From here, there are two ways the season ends -- one is winning the Cup, and the other is disappointment. For the Lightning, there is no middle ground. It is 16 wins or bust. 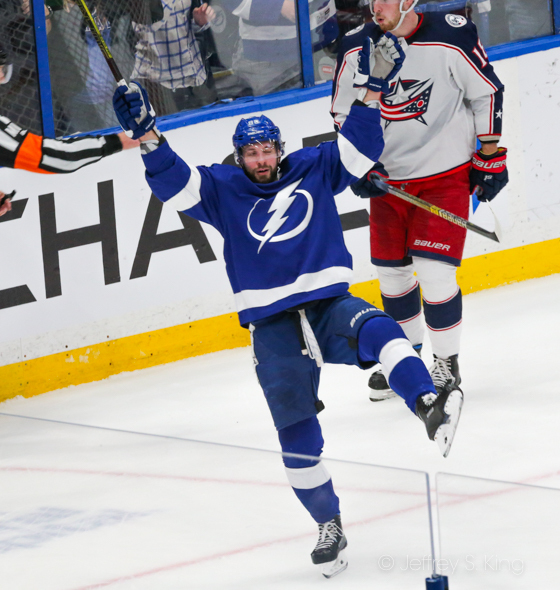 Put it this way, the Lightning could lose in Game 7 of the Stanley Cup Finals in six overtimes, and it would still be disappointing. Has a hockey team ever risked so much by continuing into the playoffs? Columbus' Sergei Bobrovsky, who played in nine more games. Steven Stamkos was fourth in the league in goals, and Kucherov was sixth, and Brayden Point was ninth. Ah, but these are the NHL playoffs, where good teams go to die. Think of it like this. The Bolts won the President's Trophy this year with ease. But nine of the previous 10 President's Trophy winners all fell short of the Stanley Cup. To advance in the first round, the Bolts will have to get past former Lightning coach John Tortorella, the crusty old coach who never met an argument he didn't like. Torts was the coach who won the Lightning's only Stanley Cup, and with Sergei Bobrovsky in goal, the Blue Jackets have a shot. How good a shot? It's hard to picture the Blue Jackets winning four of seven against the Lightning. But the second round, against either Toronto or Boston, could be more challenging. Consider this: Sportsnet had 22 writers pick the NHL playoffs. Eighteen of them had the Bolts winning it. Other predictions? The Sporting News had seven writers pick the playoffs. Six of them had the Lightning winning it, and the other had the Lightning losing in the Finals to Winnipeg. Sports Illustrated had five writers pick the playoffs. Two writers had the Bolts winning it, and two had them losing in the finals. The wild card was a writer who had them losing in Round Two to Toronto.